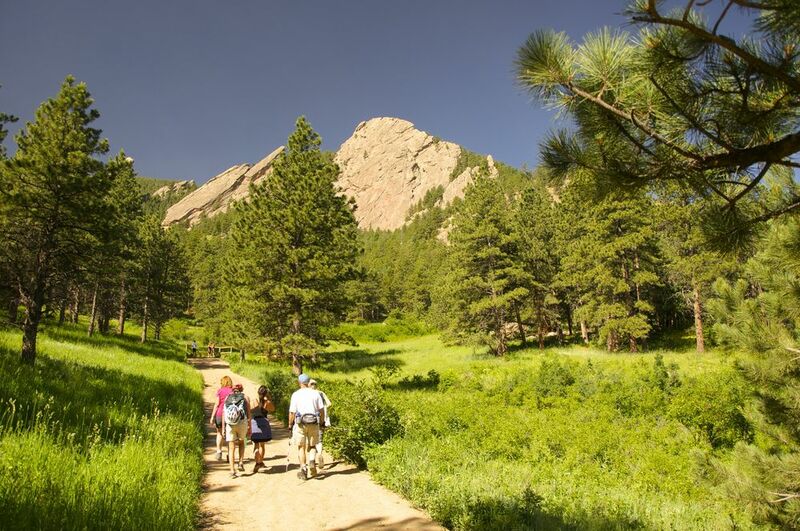 Description: The Flatiron Loop Trail is a Chautauqua tradition. Who doesn't want to stare up at one of the massive flatirons or maybe take a quick scrabble up one? If you aren't sure what the Flatirons are, you aren't alone. Check out the brief blog article What The Heck Are The Flatirons for an introduction. The Flatiron Loop is typically accessed via the well-known Chautauqua Trail and returned via the Bluebell Rd Trail. It is a beautiful hike through open meadows, pine forest, rock falls, and valley floor. It is not an easy hike, rising a little over 700' in a mile to the base of the 2nd flatiron. It is also very rocky in places both on the ascent and descent. While I would love every visitor to make this hike, it is not for everyone. If you go, consider borrowing poles if you are not very sure-footed. Parking and Trailhead: Chautauqua Park can be very crowded. If there is no parking within the park itself parking is available on Baseline Rd. The trailhead is just behind the Ranger's Cottage. Visit the cottage if you have the chance. The people there are friendly and have great advice for your day in Chautauqua. 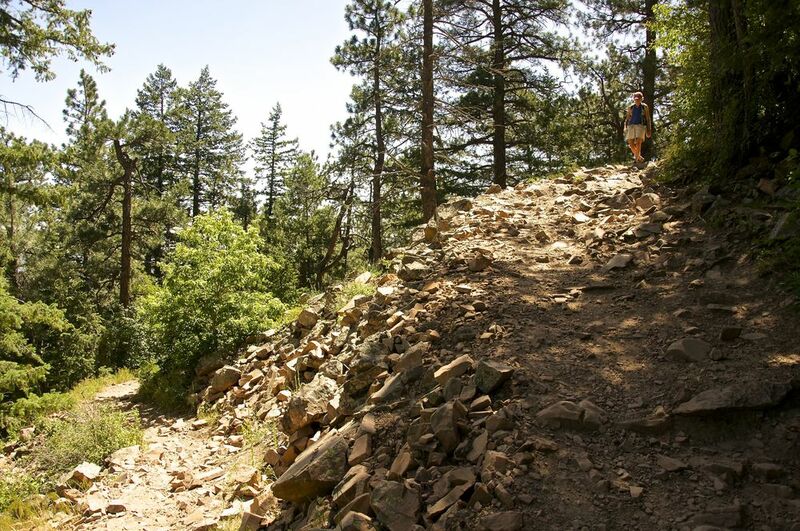 Trail Guide: This hike starts out on the wide boulevard of the Chautauqua Trail and runs fairly steeply uphill toward the base of the first three flatirons. Take plenty of rest breaks along the way to admire the flatirons and downtown views, prairie grasses, and any wildflowers in bloom. We saw lots of Mariposa Lilies (see photo) on this hike. Our guide also pointed out all the poison ivy that grows along the trail (see picture with our guide standing next to a large boulder lined with poison ivy!) At about 0.5 miles you will come to a viewing fence and the trail turns right and narrows some. 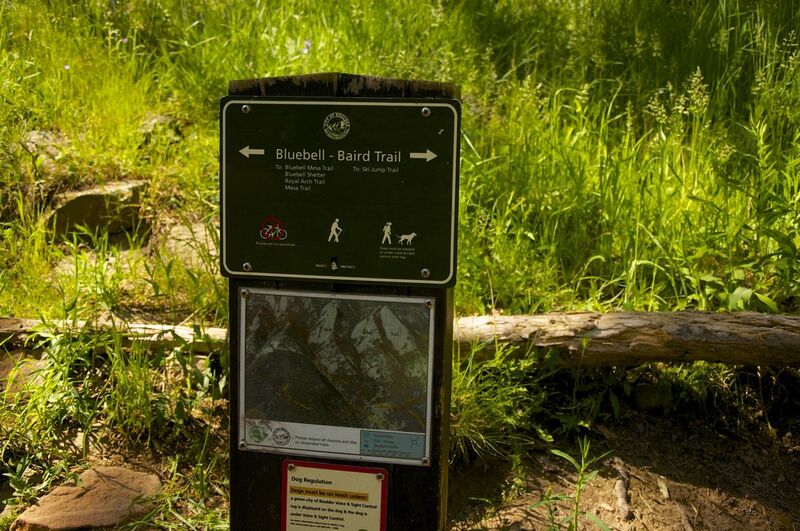 At around 0.7 miles the trail will cross the Bluebell-Baird Trail and become the Flatiron Loop Trail. There are a lot of rocky areas on Flatiron Loop because it makes its way up to the base of those massive slabs you see from town. After about a 1/10 of a mile you will come to a split. 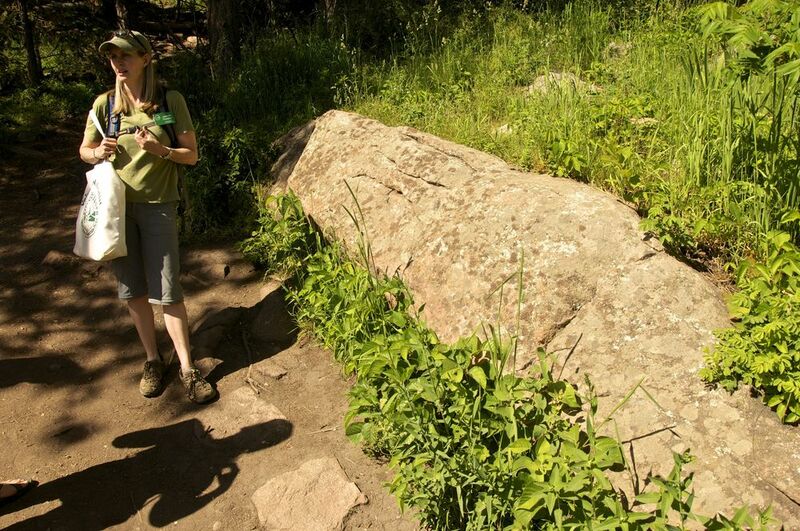 Follow the trail to the left toward "3rd Flatiron Climbing Access" and "Royal Arch Trail". You will come upon the base of the 2nd flatiron at the 1.0 mile mark. Rest, take a look at the damage from the Sept 2013 flood, and enjoy the fact that the rest of the hike is downhill! Continue on the trail, staying left at the turnoff for the Royal Arch Trail (this trail is currently closed until 2015). At 1.6 miles you will meet up with the wide Bluebell Rd. Trail where you will head downhill to the right, past the cutoff for Mesa Trail, returning to the Ranger Cottage. Après Hike: In honor of our black Kelpie, Jack, who loves to hike in Chautauqua with us, the perfect after-hike beer for this trail is Left Hand Brewing's Black Jack Porter. Lefthand is named for Chief Niwot, also known as Left Hand, who with his people, left the Boulder Valley peacefully when the white man came to the area. But, as he left he put a curse on Boulder saying, "People, seeing the beauty of this valley will want to stay, and their staying will be the undoing of the beauty." Left Hand Brewing is located near downtown Longmont, a short drive northeast of Boulder. Picnicking: Plenty of tables at the Ranger Cottage and on the green in front of the Chautauqua dining hall! Restrooms: Yes, at the Ranger Cottage and Dining Hall.